🌟 Sarah J. Maas books are always controversial, you will find extreme love and hate for all her books. And although I know that her writing is not perfect, but people have been judging and hating her without actually reading the book which is sad. I will try to answer all questions and explain my feelings here. This is a spoiler free review! 🌟 I want to start with the cover, I personally like it and it almost matches the other covers so that is good. 🌟 To give you a quick idea about this book in this series, then Wonderwoman was my favorite, this is second and Batman is the least favorite one. I believe Superman will be good and I hope so. Speaking of those authors, they are all big names in the industry and they all were below their average in this series. 🌟 If you have read SJM other books then you know that she has a good writing style but there are sometimes many repetitions and it sometimes gets on my nerves, but what I like about Sarah is that she listens to the readers. There were expectations of hot steamy scenes, a thousand Purrs and holding breaths. The good thing is that the romance in this one was not so steamy, there are only 14 Purrs and some of them are actually and literally from cats so that is good. And I didn’t find repetitions, the writing flowed easily. 🌟 The characters: Now this may be the most controversial thing here. Selina was cool and I like that Catwoman was kind of a morally gray character. She was not all good or all devil which reminds me of both the side characters Poison Ivy and Harley Quinn which were both shown in a new light and I understood their backstories and sympathized with them. SJM kept them as LGBT characters, for those who hate Sarah for not including this type of characters, well she finally did. And notice that I said she kept them and not made them because she was following the comics. She didn’t add LGBT characters for the sake of selling books or being relevant which many authors do and are praised for. 🌟 She made Batwing brown, is she trying so hard? She isn’t trying, she is following the comics, sue and hate DC for creating a “Rich Brown” character and not Sarah. Her description was near to the original character including the suit. I even liked that she mentioned him doing boxing and in the marine and daily working out which explains his physique, rather than her usual perfect-male-body-characters for no reason. 🌟 There was mental illness rep including PTSD which I don’t think was quite well done -as I mentioned this is not prefect after all- and it didn’t resolve in a good way too. I don’t even think it was a necessary addition to the story. 🌟 But there was also mention of Cystic Fibrosis (CF) which was good, I saw some cases as someone in the medical field and it was good enough for this book. But there were futuristic features in the book and many scientific advancements but no cure for CF. Probably this book was written before 2018 were a new drug was approved by the FDA and it treats the underlying cause, not only the symptoms. It is for only 4% of the patients now but she kept writing that it was incurable an that is not 100% accurate. 🌟 The story did not blow my mind but it was far more entertaining than Batman (And I am a Marie Lu stan) which was very boring and did not even have Batman as we know him!! 🌟 So as you can see -I salute you if you have read the whole thing- this is not a perfect book but it is also not the worst. I liked many parts of the stories and that Sarah is trying to improve her writing. All in all I gave this 3.25 stars. Great review. I haven’t read any of SJM books and I never interested to, but I think I;m gonna read this one soon! Great review. I just got notified that it’s at the library ready for pick up! Wonder Woman was so good, I don’t know if it will be topped! First this is a perfectly honest review! Second I love your illustration and the small kitten. Just too bad it was not even better for you Hamad! Let’s hope my next reads are better! I’m glad to see that SJM stuck with the comics as far as keeping the characters LGBT! Previously when she wrote LGBT characters in Throne of Glass (Aedion, Hasar to a lesser extent) and ACOTAR (Morrigan) it felt a little forced and reactive to criticism. 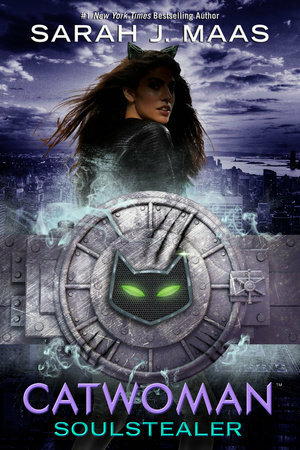 I look forward to reading Catwoman! I hope you enjoy it. Actually it was good but I saw some people judging her and thinking she forced it apparently not knowing the comics references! Wow it’s interesting that sometimes people are so used to the norm of straight white characters that any deviation from it seems ‘forced’! Go back a few decades and I suppose action heroines would be the same way–now they are everywhere but a character like Selina or Diana from Bardugo’s novel in YA literature would have stuck out then.